I've been worried about this review. And by all accounts I shouldn't be, but I still am. I knew it was only a matter of time before the major labels 'reacted' to the success of Chris Stapleton and the burgeoning indie country scene. And thus they did it like they do any other trend in mainstream music: swoop down and find an indie starlet that could be guided towards the mainstream and throw her enough of a budget to capitalize on the sound. Here's the problem: what an artist like Chris Stapleton has is significantly harder to fake than your average sonic gimmick. Heartfelt raw soul and the production of Dave Cobb has the sort of texture and deeper impact that resonates on a frequency that's tough to categorize, and also signifies the sort of authenticity that's even harder to deliver. But it looked like Columbia Nashville was going to try anyway with Texas country artist Maren Morris. Like many red dirt country acts she had been in the independent scene, and actually released three albums on smaller labels, but with the push and success of 'My Church', it seemed like the label was set to satisfy three trends at once: Texas country, a rougher, more soulful country sound, and the recent lyrical trend for more country to reference religion without outright being religious music. And so with the groundswell behind 'My Church', they pushed a debut album out as quickly as possible and now we've got HERO. And look, 'My Church' is a damn good song, but I've been down this road a number of times before, and I had real worries that Maren Morris might not be able to deliver as promised. So I checked out her debut - was I wrong? Well, here the issue: what we have here is a near-classic case of a label bait-and-switch, targeting critics by driving up buzz with a track that hops on the bandwagon to disguise an album that only pays lipservice to it at best. As such, if you're a critic and you go in expecting a major label pushing an authentic artist in that vein... well, the label won't care, they got your money, but you're probably going to be disappointed. But separate yourself from that baggage, and is the album any good? Well... it's alright, but I think my disappointment here runs deeper than just the bait-and-switch, because it should have been better. Because here's the first thing to note: for as much as 'My Church' is a country song, there are enough subtle indicators in the production to reveal that this record leans much more towards pop - and when I say that, I mean the modern brand of percussion-over-melody modern pop that tends to place the beats to the front and let the guitars function more to establish the atmosphere or melody, not drive it. And what gets odd is that for the most part, there's a fair amount of organic flavour to this record - when the acoustic guitars, piano, and hammond organ do show up, they've got texture... only to be split apart by drums that have more crack than actual depth and formless basslines. Most of the electric guitars show up soaked in reverb, but what gets baffling is how inconsistent the production actually is in establishing a tone and mood. The ragged low acoustics that open up 'Sugar' then break into your standard pop country jingle, a similar trick that occurs on 'Rich' that breaks into a progression that might as well be out of Weezer's 'Beverly Hills', and then there's 'How It's Done' with the lo-fi fuzz with the muted organs that tries to build it out for a hook with no guitars at all! 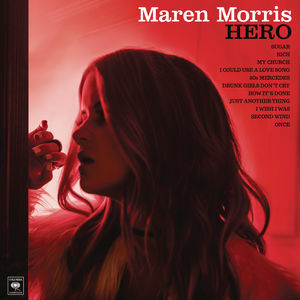 I think Maren Morris and producer busbee might be trying for soul with a few of these songs, but it's hard to pinpoint a consistent sound across this entire album, from the more defined country melodies of 'My Church' and 'I Wish I Was' to the piano and wiry low synth that reminds me way too much of 'Stay A Little Longer' by Brothers Osborne behind the blatant pop of '80s Mercedes', or the island touches in the guitar on 'Drunk Girls Don't Cry' that add up to so little beyond empty fragments. And you can tell that they're trying to blur these fragmented pieces together with reverb - they definitely do this for the guitars on the bridge of 'Once', a moment crying out for a solo that never happens - but without defined melodies it ends up leaving many of the instrumentals just feeling formless and lacking in hooks beyond Maren Morris' vocals. Granted, that's not really saying much, because I'm not all that wild about Maren Morris as a singer. Sure, she's not bad, but it's also clear her handlers are not guiding her towards any sort of traditional country delivery. More often than not she reminds me Miley Cyrus' stabs at country, and that's not counting the points where she tries for a vocal style that's more reminiscent of Rihanna, and it only further emphasizes how non-country so many of these tracks are. And sure, from a pop perspective that can work, but I get the weird feeling that with the lighter backing vocals and multi-tracking that this record is angling more for pop country and thus it lands in a weird spot in between. It doesn't help that the vocal production is once again inconsistent, for the most part fine except for the thin filter over the backing vocals on 'Rich' or the more lo-fi pickup on 'Just Another Thing'. And it's hard to tell if any of it was considered to enhance Morris' strengths - I get why she included 'Second Wind', the standard empowerment anthem that she wrote and originally landed as a bonus track on Kelly Clarkson's last record Piece By Piece, and while the production has more flavour here, she's just not as impressive of a singer. But okay, that can be excused if the writing came through... and I'm honestly not sure it did. Again, it's not so much bad as it is inconsistent - as I said when I covered it on Billboard BREAKDOWN, I like 'My Church' for finding spiritual fulfillment, and 'I Could Use A Love Song' is a solid low-key follow-up, hoping to break her lonely cynicism with the power of a good love song to at least ignite the fantasy. And when she wants to, Maren Morris can write a pretty decent breakup song, the standout being 'I Wish I Was' where as much as it all makes sense on paper and despite wishing it were otherwise, she needs to end the relationship because she's not in love. It's a shame, then, that the rest of the album doesn't really impress me in the writing, with the absolute worst example being 'Rich'. I get the conceit - if she had money for all the times she went back to this ex, she'd be rich, a topic she later repeats with less detail on 'Just Another Thing' - but the technical rhyming is sloppy and it seems like an excuse to throw in a flexing chorus that wouldn't be out of place in luxury rap! Similar mood for '80s Mercedes', which operates as all definition for her but lands no payoff beyond a cute fantasy. What gets truly weird are songs like 'Drunk Girls Don't Cry', where she's trying to tell a friend to dump her garbage boyfriend instead of lying to herself to take him back, the sort of lie just like saying 'drunk girls don't cry', a line that feels oddly disconnected from the rest of the song. And on that note, while I have no issue with swearing in pop or country music - even if mainstream country remains oddly puritanical about it - often here it feels a little lazy and doesn't punch with nearly the same impact. But beyond that, I'm at a bit of a loss to say with this record. It pulls from pop, country, and maybe even a bit of soul, but only pieces fit within the genre, the rest falling into an mass of muddy organic tones that don't really coalesce into melodic hooks. It's telling that the best moments on this record are when we get more of a country flair, but that's less because of the genre choice and more the fact there's a instrumental melody and a little more definition. But the majority of these tracks have the feel of modern pop pushed through a roughly organic lens, and with only decent writing and performances, I'm not sure it does enough to stand out as all that special. For me, it's a strong 5/10 and a tentative recommendation, if only because I can see country radio pushing even some of the non-country singles and you might as well get used to them. Otherwise, it's an experiment with inconclusive results - make of it what you will.